This preview image is mostly an image taken from the video. It should clearly mark the content of the video. Ideally, the preview image also displays the title of the video and a “start button”. as well as the size of the video. The preview image is selected in the opening “Select Preview Image window. In this window, the video is played directly after it has been copied (which may take a while!) ..
From this video, the preview image can be copied and designed using the available controls. “Scrub” video, i. maneuver through the video with the slider (“roll”). With the slider you can quickly jump back and forth through the video to find a suitable place for the “snapshot” of the video. 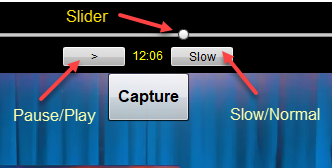 You can also pause the video with the Pause button and let the video slow down. This helps everything to find a suitable Previe- image. If an image is displayed that should be used as a preview image, this can be copied from the video using the@Capture@key.